Miami is famous for its beaches, culture, big events and sports teams. From shopping on South Beach, to connecting with Cruises out of Miami Port. Unknown by many, Miami fishing is recognized for some of the greatest Offshore fishing in the world and NO ONE does that better than iOUTDOORS. But a Miami fishing also can be a nature adventure which can only be done in the freshwater while fishing side by side with the alligators and birds. The Miami fishing climate allows for year round fun with great results. Miami fishing options including largemouth bass, Peacock bass and the Asian Snakehead, just minutes from the Miami airport and downtown. Depending on the time of year and conditions, there are different species of fish to target fishing live bait, artificial, by fly and top-water fishing. Miami fishing is known as one of the top saltwater fishing destinations in the world. Many forget about the spectacular freshwater fishing Miami has, the headwaters for the Everglades National Park and quoted by the Fish and Wildlife as the number one bass fishery in Florida for action! Yes…action, it’s not uncommon to catch 100 plus fish on your trip. So while your friends are out cruising around in the ocean catching two or three fish, you can be enjoying the sights and sounds of the Florida Everglades. Alligators so close you can kiss them…but not recommended. Are you ready for a superb South American fishing experience, without having to travel there? A chance to catch a hard-fighting, butterfly peacock bass? How about if you can do it without leaving Florida and just a stone's throw from the beaches of Miami? 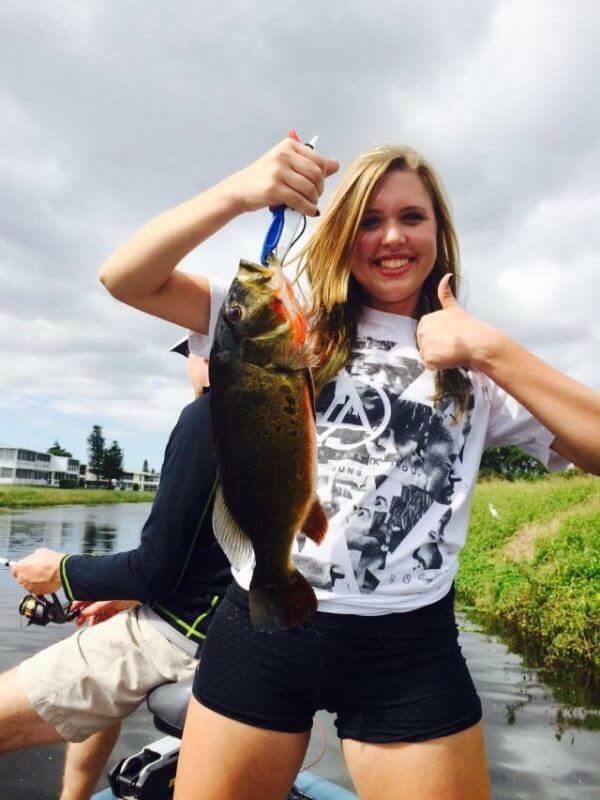 Our Peacock Bass Fishing Guides will take you on an urban fishing trip you won't forget in the South Florida area Lakes and Canals. 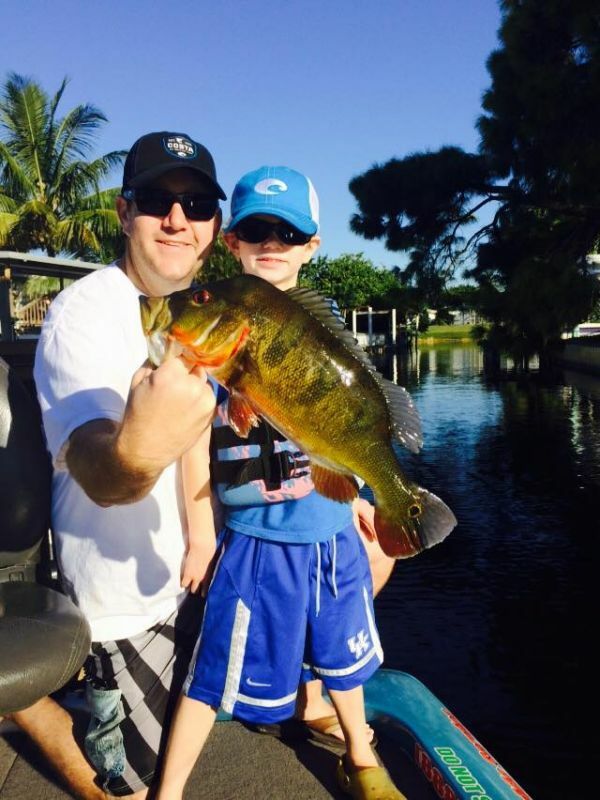 The Peacock Bass have flourished in these urban canals and lakes over the last 20 years and all of this great fishing is just a stone's throw of most anywhere in Miami. We specialize in just Miami fishing for Peacock Bass. 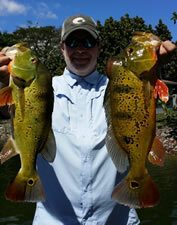 Our Guides are the most experienced and simply the best that fish for the Florida Peacock Bass. Our crew at Bassonline.com will gladly assist you in planning your next Florida fishing trip that’s guaranteed to create a lifetime of memories! BOOK YOUR AIRPORT LAKES TRIP ONLINE NOW! When fishing Miami Lakes and Canals there is good opportunity for anglers to catch Peacock Bass, Largemouth bass and even several other species of fish. Miami Lakes and canal is based in Dade County, and has a many features, lakes, parks, as well as a picnic area that are equipped with very nice restroom facilities. The fishery is made up a series of Lakes and Canals, the lakes as well as the canal intersections and culverts are generally productive areas for catching most species of fish. Shoreline vegetation, rip-rap areas, and shady areas associated with bridges and culverts also provide excellent places to fish. Miami lakes are what is called the "Falls" is about 32 miles of lakes and canals connected to other lakes by a canal system. Aquatic vegetation consists of cattail, spatterdock, and hydrilla. The fish are attracted by the large amounts of bait in the system. The Aerojet canal located in Homestead just minutes from the Florida Keys. You fish a casting distance from Saltwater all while enjoying the catches only provided by freshwater. Because of its place it gets very low pressure and in return grows really big BASS, a few of the side benefits of being located so far south is the capabilities to grow and keep up PEACOCK BASS in the same fishery. Aerojet canal is never noisy and congested Aerojet Canal like some commercial, maybe a few extra anglers on the weekends. Traveling from the boat ramp, it doesn't look like must. But like most canals, this one especially it has its SWEET spots that always seem to hold fish. With that said, this place has a lot and is generally productive for most anglers with a little knowledge of the area. The entrance off the road of US1 is a bit difficult to see and access, especially with weekend traffic. The Aerojet canal is a flood control and has a structure on both ends. It fishes like a combination of Tamiami and Snapper Creek canal systems all while providing urban anglers more exciting fishing opportunities. Peacock Bass Fishing Aerojet Canal offers some of the most exciting and varied canal fishing in all of southeast Florida. Several anglers have reported canal ‘trifecta’ or ‘grand slam’ catches of butterfly peacock and largemouth bass topped-off with a Snook. BOOK YOUR AEROJET TRIP ONLINE NOW! Visit the Everglades Holiday Park in the Florida Everglades and witness nature’s wonders all around you while Miami fishing. The river of grass will amaze you as we drive our late-model bass boats to the fishing destination. It’s a thrill plus very educational. Stay confident this is not just another airboat tour, it’s an experience that you get to explore the Florida Everglades and catch bass all in one! Home to hundreds of Everglades creatures and watery wildflowers. Everglades Holiday Park is the perfect place for both entertainment and learning. Explore a forest of unspoiled wonders at the Everglades Holiday Park and see for yourself what makes the wetlands so wildly wonderful. The Everglades is an attraction in Miami not to be missed, the hidden secrets of nature’s own will develop your curiosity as you explore Everglades Holiday Park and Sawgrass Recreation Park in Broward County. Come out, explore and let’s go fishin! Captain Brett Isackson Capt. Brett Isackson is a full-time South Florida fishing guide, specializing on Miami Peacock bass and large-mouth bass in the Everglades and on Lake Okeechobee and has been known to be vary versatile, live-bait or artificial he can catch them. No trip is too long and there’s always more fish to be caught, that’s his motto. Capt Roger Gonzalez is a local bass fishing professional. Experience includes Stern Series, BFL tournaments and many other local tournaments including two-time top 5 finishes on the FLW Tour. Miami is home to a wide variety of beautiful fish species. When fishing sunny South Florida in and around Miami and South Beach we all know the deep sea fishing in Miami is excellent year round and you can expect almost everything. but hold on, the Miami freshwater fishing has its share of exciting species as well. 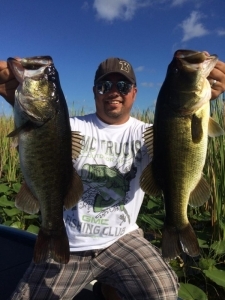 Home of the Everglades, quoted as the #1 bass fishing in Florida for share catching. And while the local area has its share of trophy bass fishing lakes it have several other species that may peak your interest. Miami fishing trips are also the home to might Asian Snakehead, a topwater giant that will demand your respect if you try. But lets also not forget about the hard fighting Peacock bass brought hear from South American & more. There isn't any place in the world to match the opportunity and with measured accomplishments for anglers then when Miami fishing. It maybe the land of beaches, great food and nightlife but the fishing it what keeps people coming back.